Welcome to the Paper Playtime Challenge "Anything Goes" and DT Blog Hop!! Sooooo..... Who's ready to HOP??? If you've hopped over from my talented Design Team Sister, Sherri, then you are in the right place!! If you've just popped in to visit my blog or are reading this via email and you'd like to join our FUN, then please go to the Paper Playtime Challenge Blog to start at the beginning... I wouldn't want you to miss out on any of the CREATIVITY!! This is a standard A2 sized card (4.25"x5.5"). I used my Creative Memories Corner Punch to round the corners of my card... I also used my Copics to color this silly PiRAT digi stamp from Dustin Pike -- Each time I use my Copics, I get a little more excited about what I can do with them... I just can't believe how easy it is to get used to those Copics!! Have you tried some yet??? Now that your time with me is done, you'll want to continue to my DT Sister, Sharon, who has a SUPER CREATIVE project for ya!! And just in case you've missed anyone (or want to visit again), I've included all the links for everyone's projects below!! 9 - Sharon - Go here NEXT!! So cute Amy!!! Your coloring is fantastic and the image is just adorable!! Love the faux stitching-looks awesome! Adorable card and I totally love love the song!! Totally love that cute image. Great sentiment to go with it. Fabulous job. Aww how cute is this???? I love it! Your coloring is awesome and that sentiment is perfect for the image! Super cute card!! I wish i could afford to play with copics!!!! i love the look of them!! That is a very pretty song!! Very cool how they made it at home!! 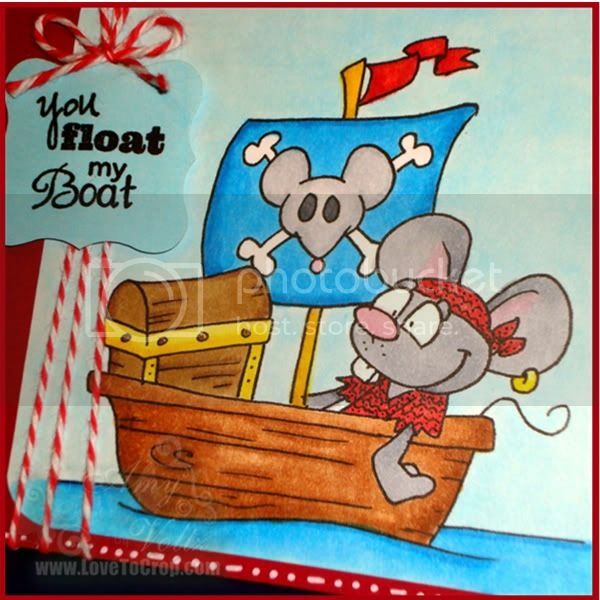 Such a cute little mouse in your boat. Your colouring is great and yes, Copics are so much fun. The sentiment fits perfectly as well and that song.....too cute!! Hugs. I love this my friend it is so cute and that song is just too cute also. love all of it. So much fun!! Just love the little mouse. TFS! omgosh Amy, your post all goes together so well! what fun, love your image, sentiment & song!! well done! Just love your image and sentiment. Your coloring is amazing. Fun video too! TFS! Wonderful image choice for this challenge. I love your coloring too! Thanks for joining us at "Pike's Playground." So cute Amy. Love your coloring and the sentiment. Just awesome. 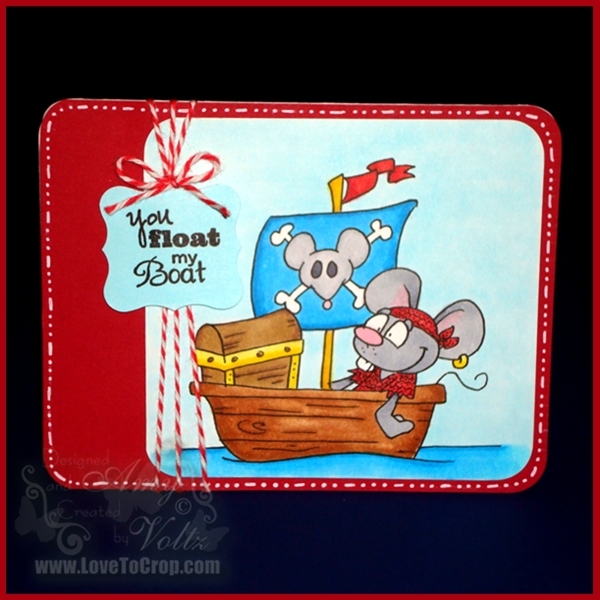 Captain Jack Sparrow fan likes this cute whimsy card. Amy this is adorable! You colored it perfectly too. I love the face of the little mouse. I love even more the song, and your heart. Whoever it is that floats your boat is a lucky person. that is such a really cute card!!! Love it. BEST post of the year! I shared the song on my FB page and your card is perfect for the sweet song. Thanks for ALWAYS inspiring me...hugs, Claire S.
Another super cute card Amy!! I love when I visit a fellow crafter & they have something that just makes you laugh or smile. This card did both! It's fantastic! How cute!!! All goes well together. i love the card. would be great for send love today. You KNOW I love your work... but look at that stinkin' cute PiRAT! Oh my... haha I love it. Thank you for keeping me inspired! Oh My Gosh! This is so cute. 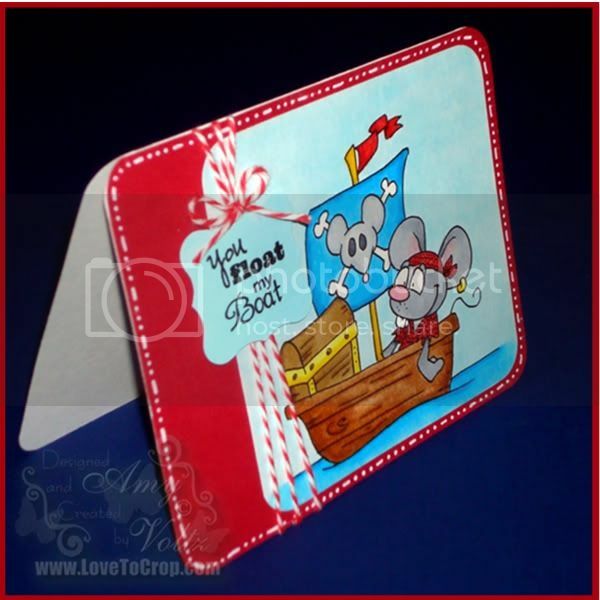 I love the little mouse and sentiment. TFS AJ! Okay, I must say this is the first blog hop where I've gotten to listen to a song. And, what a sweet one! I DID download it so I can sing it to my son! 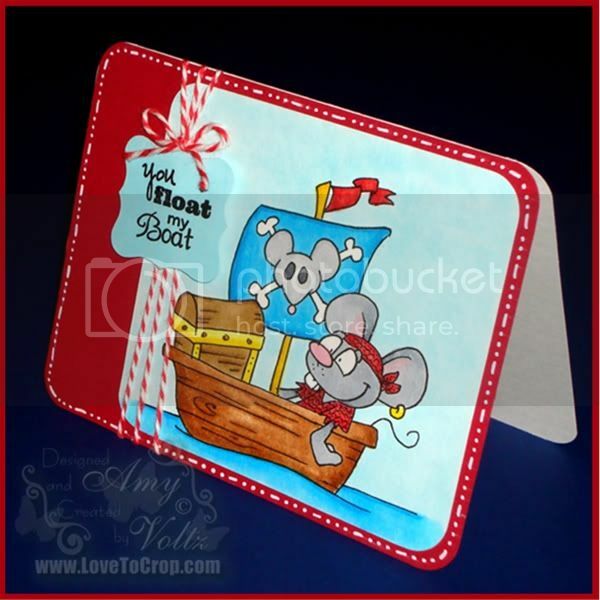 You boat card is a perfect match to the song! Thanks for letting me hop over here. I'm so glad I did and now I'm your newest follower! Such an adorable card and perfect detail/coloring! Thank you for sharing. Amy, First off, love your card, Digi Stamps are looking good to me. Secondly, I watched the Video and love the song. The video is so cute...wonder if you used Cricut to make some of the Props...lol. It is a fun song. Will have the dh get it off Itunes. That's a refreshing way to visit one of my favorite Blogs...thank you! Amy, OOOPS! I meant "Wonder if THEY used the Cricut to make some of the Props." Great image and I love what you have done with it. Great job thanks for joining us at "Pike's Playground" I hope you join us again soon.